Below you’ll find the canonical reference for Independence Day email planning. From email examples to specific promotional strategies, we’ve included everything you need to ace your campaign. We love a good pun, and this one qualifies because both hot dogs and overheated pooches are part of Fourth festivities. 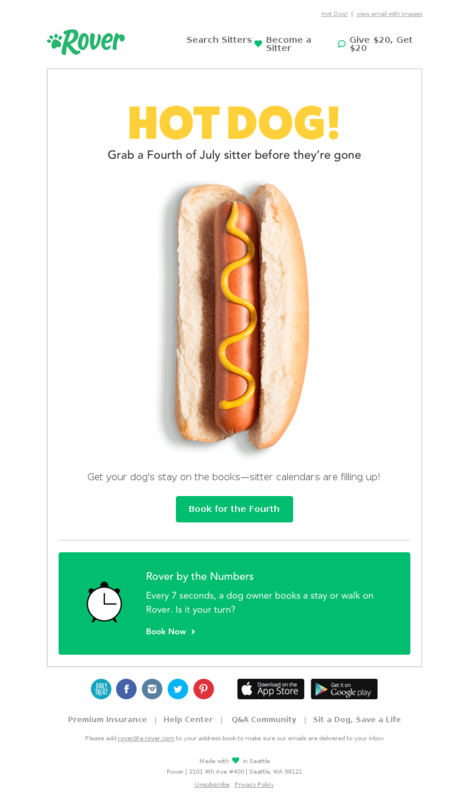 This email's animation is a subtle but clever reminder to keep Fido and Rex far away from the fireworks fray. It's clever piggyback marketing for a service that otherwise doesn't have a clear Independence Day tie. This email nails the hanging-out-with-friends vibe that’s a huge part of Fourth celebrations. We liked the casual feel of the photos, which turns typical style-guide pics into a collection of photos you might see in your Instagram or Facebook feed. Also note the prominent value proposition - “fast and free shipping in the US” - which can encourage its faithful to choose this Idaho-based boutique over its competitors like H&M and Forever 21. July Fourth marks the last big showcase for summer merchandise before retailers have to start clearing the racks to make room for back-to-school and transitional wear. This style guide thinks like its customers, who are shopping for party outfits, not just a top or shorts. An understated Fourth theme - red, white and blue lettering and red stars on a pink background - set it apart from the usual stream of fashion emails. You want fireworks? 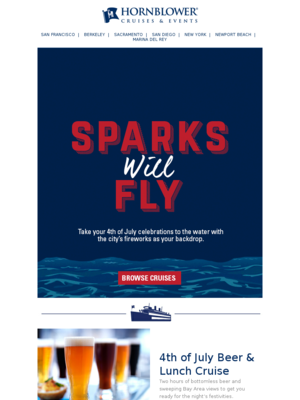 This understated email has a great animation that blends fireworks and moving water to promote the cruise idea, and it goes beautifully with the “Sparks Will Fly” headline. Baseball is another all-American activity on the Fourth of July, whether you’re on the field or in the stands. 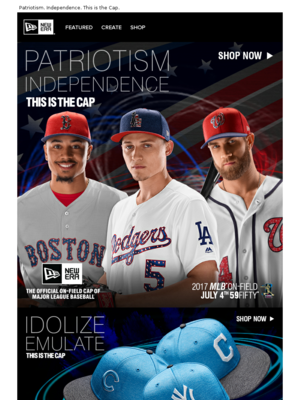 This email takes a low-key approach to both baseball as an American sport and the patriotic feelings it evokes. 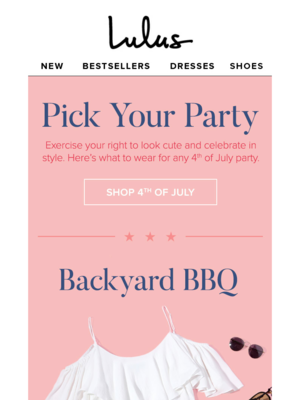 Start planning your 4th of July email strategy with great examples. This UNTUCKit email calendar is based on UNTUCKit, who sent 5 emails for 4th of July in 2018. This Chaco email calendar is based on Chaco, who sent 1 emails for 4th of July in 2018. This Macy's email calendar is based on Macy's, Inc., who sent 0 emails for 4th of July in 2018. Will you simply send one email on 4th of July or will you send a few emails leading up to it, including a “last chance” email once the event is over? Based on 3594 emails mentioning "4th of july", "fourth of july", "fireworks", "independence" in the subject line. Discover the most popular types of promotions used for 4th of July. Understand how steep a discount companies offer for 4th of July. You can toggle between Dollars Off and Percent Off. Ace your 4th of July email content with these ready-to-implement strategies. Enjoy! For marketers, the Fourth has multiple personalities. First, there’s the appeal to patriotism and a shared cultural heritage that belongs to all Americans regardless of when and how they arrived in the country. Second, the Fourth has come to be seen as the high water mark of summer, with the rest of the season sliding slowly down toward fall with its home, school and work duties. Although the Fourth isn’t a big gift-giving occasion, shopping for food and party goods (everything from clothes to decorations to home decor) gives you more opportunities to reach customers. Although not one of the NRF’s top 10 consumer holidays, spending on the Fourth is still expected to top $7 billion. Even if your products don’t fit the food-fun-family-fashion theme, a creative hand with a red-white-and-blue color scheme gives you a relevant angle and the opportunity for your creative team to flex its muscle. Let’s dive into some concrete strategies. Today, the Fourth of July is the ultimate party day, whether you’re getting the family and friends together or celebrating with the masses at a parade, picnic and fireworks. Design your email to appeal to that hunger for carefree happiness, togetherness and community spirit which is unique to the Fourth. The Fourth of July offers a good opportunity for adding animation to your emails because it’s such a visual holiday. Fireworks are an obvious choice, but a quick search through the MailCharts archive will turn up some emails that use animation in different and even more creative ways. Look for animated backgrounds and hero images. 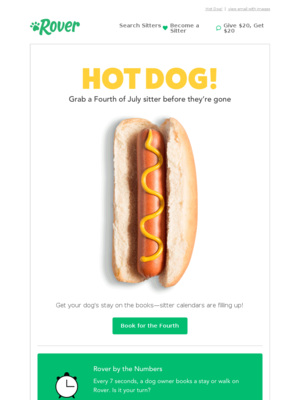 July 4th promotional emails can be challenging because they overlap other holiday seasons such as Memorial Day, Father’s Day and graduation. You could boost your frequency (and potentially annoy your customers) with single-campaign emails, or you combine them into a single email, adjusting the content as each holiday approaches. Some Independence Days are a marketer’s dream, because they fall close enough to the weekend to create long, spendy weekends. When the Fourth lands smack in the middle of the week, as it will in 2018, the long weekend gets a little more remote. Still, let customers know whether you’ll have the lights on this Fourth with an email that you send on or before the holiday. Besides store hours, think about other services that holiday closures could affect, including customer-service or support hours, holiday shipping deadlines or delivery services. Also, add a store-location link for people who find themselves in a strange place on the Fourth with a few extra hours on their hands. The Fourth of July is one holiday that we don’t share with the rest of the world (although it comes on the heels of Canada Day, on July 1). 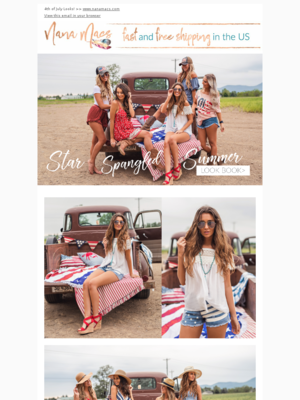 Because of this, many retailers look to tap into common feelings of patriotism through copy, images, products, and calls to action. Should you go all in on the Stars and Stripes Forever theme or soft-pedal the patriotism? Rely on your brand identity and customer personas, what you know from past campaigns, and even what you might learn from your customer-facing departments like customer service and in-store personnel to guide you. Because Independence Day is an American-only celebration, consider suppressing addresses of customers who live outside the U.S., using either location data or email addresses that are clearly non-U.S. If you have a significant Canadian population, you can make your Independence Day message do double duty by soft-pedaling references to specific holidays.